There comes a point when a parent needs to get their little kid out of the diapers and onto the toilet seat. This transition is not easy for the child or the parent. It requires a lot of patience along with the right gear, which is why getting the best toddler toilet seat becomes an absolute must for the child’s comfort and confidence, and ultimately his or her success. One of the biggest advantages of using a toddler toilet seat is that it requires no cleanup, unlike a toilet chair. Furthermore, because of their small size, they are easy to carry around everywhere along with you. Lastly, by making your child use a toddler toilet seat, he or she will get used to sitting on a toilet quite early on. As a parent, you only want the best for your child. So, keeping that in mind, we tested quite a few toddler toilet seats to see which one the toddlers enjoyed using. In the end, we carefully narrowed it down to these three. Let us review each of them briefly. Jool Baby Products is a company that was founded by a dad of three who devoted his time and energy to researching child safety products that are hassle-free. This led him to create products for children that are safe and simple and that he himself would use in his home. The company manufactures products that many infants and toddlers enjoy. What’s more is that they donate a portion of their profits to the less fortunate families. 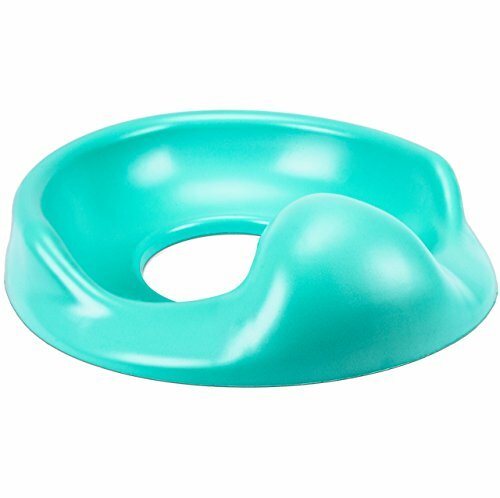 As mentioned earlier, Jool Baby Products focuses on simple and safe designs, and this is very clear the second you take a look at their Potty Training Seat. The design is minimal and effortlessly blends in any bathroom. However, its major focus is on the product’s practicality. The dimensions of the seat are 15.4 by 11.8 by 3.5 inches, and its weight is about 8.2 ounces. These dimensions make it perfect to be used on both oval and round toilets. This also makes the toilet seat quite sleek, unlike the other bulky counterparts on the market. The seat has a specially designed splash guard that prevents the urine from spilling out. This, in turn, keeps your bathroom clean. Speaking of cleaning, all it takes is a simple wipe with a damp cloth to clean this toilet seat thoroughly. 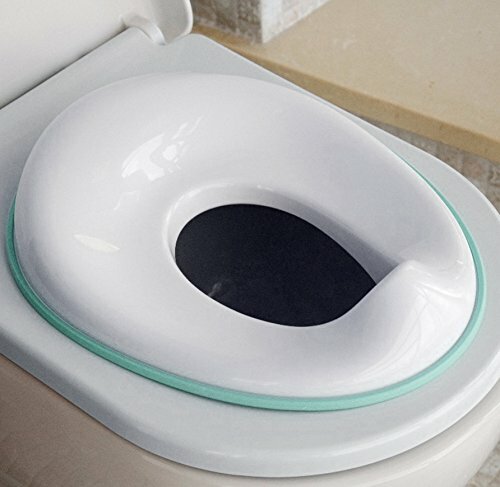 In terms of safety, the seat comes with a non-slip rubber grip, available in an aqua color, and will securely fit on every toilet. This ensures that your child never slips off of it. Furthermore, there is also a damage-free adhesive hook that comes with this seat, which will allow you to stow this away conveniently when not in use. Lastly, the company is so confident in their product that they are offering you with a lifetime money-back guarantee if you aren’t satisfied with it. HEYOK Baby is a company that exclusively manufactures products like toilet seats and step stools. Their products are crafted only from the best quality materials. This is the reason why they have been awarded the prestigious Mom’s Choice Award. In addition to selling baby products, HEYOK Baby also runs an online blog for new parents. This blog provides reliable tips for parents all over the world. If you are looking for a cute and fun-looking toddler toilet seat with great functionality, then the HEYOK Baby Potty Training Seat is exactly what you need. The toilet seat comes in a color combination of white and grey. It measures 13.6 by 11.2 by 1.7 inches and weighs roughly six ounces. These specifications make this toilet seat easy to carry around when you are traveling. The toilet seat is quite easy for a child to use and is also easy to install. In just a couple of seconds, this seat will securely fit on your toilet whether it is oval or round. The company has given a lot of thought to the toilet seat’s built, which is made from a high-quality material that makes it extra durable. You can save this toilet seat if you plan on having another child as it is long lasting too. The seat, in itself, has a soft, gentle texture with a non-slip under. This will make your child feel safe and comfortable when he or she is seated on it. Founded in 2007, the HelloBaby is a trusted company from London. This brand is known to manufacture and sell only high-quality, fun, and practical baby products. Their products aim to help parents all across the globe. The HelloBaby Potty Training Seat is a simple and easy-to-use toilet seat that your toddler will truly enjoy. The seat is available in a turquoise blue color. It weighs about a pound, and its dimensions are 13 by 11.1 by 4 inches. This seat fits extremely well on almost all toilets that are round and oval. For oblong toilets, all you need to do is slide the seat towards the front of the toilet and let the child sit. The weight of the child will hold it in place. What we liked most about this product is that it comes with Comfort Foam Technology. This seat is significantly comfortable and gentle for your child to sit on compared to other toddler toilet seats on the market. More than that, there is also an inbuilt splash guard that is quite high. This feature is great in that it helps keep your bathroom clean, especially for baby boy learners. For safety, the seat comes with anchors and a backrest that keeps the child well secured when seated on it. These three best toddler toilet seats will allow your toddler to enjoy toilet time and also train them for the future in order for them to become more independent. Between the three of them, we personally liked the HelloBaby Potty Training Seat a little more than the others. Why? This is because it comes with a foam cushion, which keeps the baby comfortable and the potty training less stressful. Furthermore, it is designed quite well and is particularly great for baby boys and girls alike.